At Centerville LTC pharmacy our pharmacists help monitor medications that patients take to help ensure compliancy and avoid potentially dangerous drug interactions and complications. Our packaging systems and documentation help care givers and patients keep track of medications currently being used and help ensure medications are taken in specific doses at set intervals. We understand saving money is a top priority for your facility and residents. It’s our goal to ensure delivery of the lowest net cost while improving the health of your residents. We offer E-prescribing through the use of Surescripts. This helps initiate medication orders, refills and renewals. Plus our Helix software program will interface with most E-Mar systems already in place. Our ability to streamline communication and data gives your staff more time to devote to caring for your residents. Proudly Serving Ohio for over 30 Years! Centerville LTC Pharmacy is an independent, locally owned closed-door pharmacy that has provided pharmaceutical services in the Miami Valley and Southwest Ohio for over 30 years. Our institutional pharmacy offers customized medications and supplies to clients with special needs. Our team of professionals work with a variety of group homes, assisted living homes, DODD/SMD facilities and mental health facilities, plus many other behavioral health service providers. The offerings of Centerville Long Term Care Pharmacy support quality pharmaceutical care and cost management, for both facilities and residents. In addition, our staff undergoes continuing education to ensure our pharmacy and team remains up-to-date with the most recent therapeutic guidelines. Centerville LTC Pharmacy realizes the importance of our facilities to expect caregivers to provide top-notch care to their patients. We provide classes to our prescription clients’ caregivers to help maintain a level of excellence of patient care. A 2-day class is held monthly in Medication Administration & Health Related Activities. Additional classes can be scheduled for a facility. Other classes such as CPR/First Aid, G-Tube/J-Tube, & Subcutaneous Insulin Injection are scheduled upon request. All requests for classes must be confirmed. Strip unit dose packaging is individually tailored to each client’s prescriptions making it safe and easy for a qualified caregiver to use. The client’s entire routine medication regimen is in an all inclusive, single-day packaging system that is divided into four time passes (morning, noon, evening and bedtime). 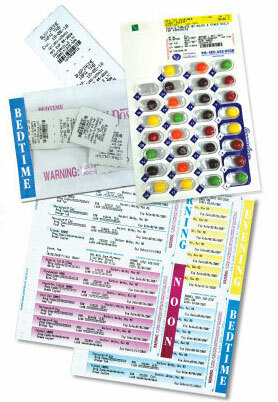 Blister packs provide a visual reminder enabling the caregiver or patient to monitor their daily medication. group homes, assisted living communities, long term care facilities, and skilled nursing centers in Dayton, and all surrounding areas within a 2-hour radius. We have been using Centerville LTC Pharmacy for several years. They provide packaging and documentation that enables are caregivers to efficiently pass medications to our residents. The pharmacists are available and helpful and their drivers are always friendly. Centerville Pharmacy is a great pharmacy to do business with! The customer service is good, our medications are delivered in a timely manner. The delivery men and women are nice. If an issue occurs, it is taken care of with without hesitation! Centerville Pharmacy will continue to get my business!